A shield, with symbols based on those found in prehistoric rock art. Medicine of a kind, for me and for you. Mandalas are medicine. Medicine is political. Mandalas are political. If you’re avoiding politics in your art – that’s political. 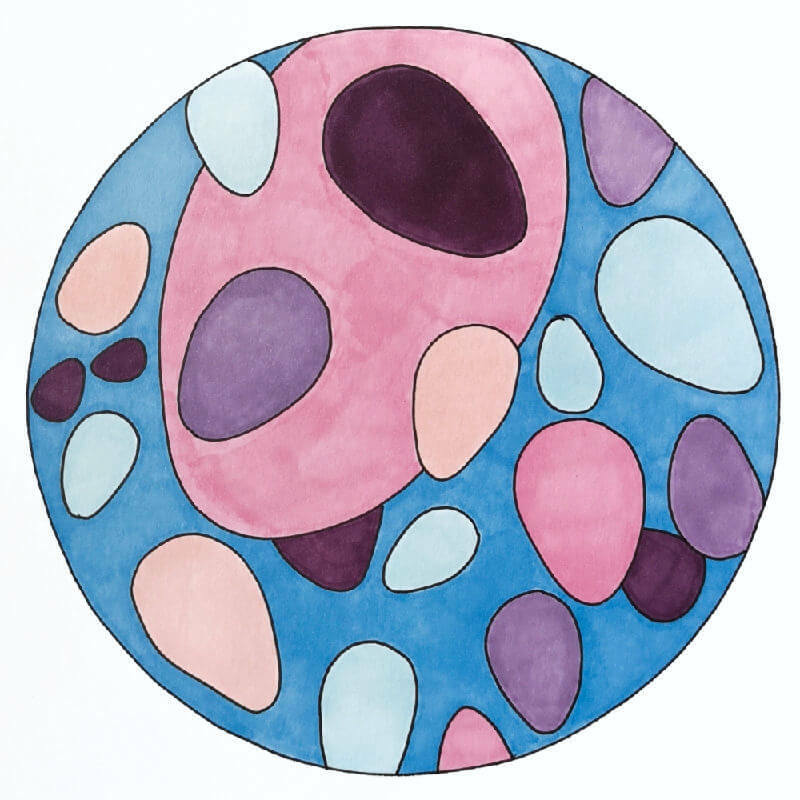 After days of creating measured geometric mandala drawings, I was moved to paint something completely free-form. It’s imperfect, like real life. The lines are uneven and the circles may be off centre. 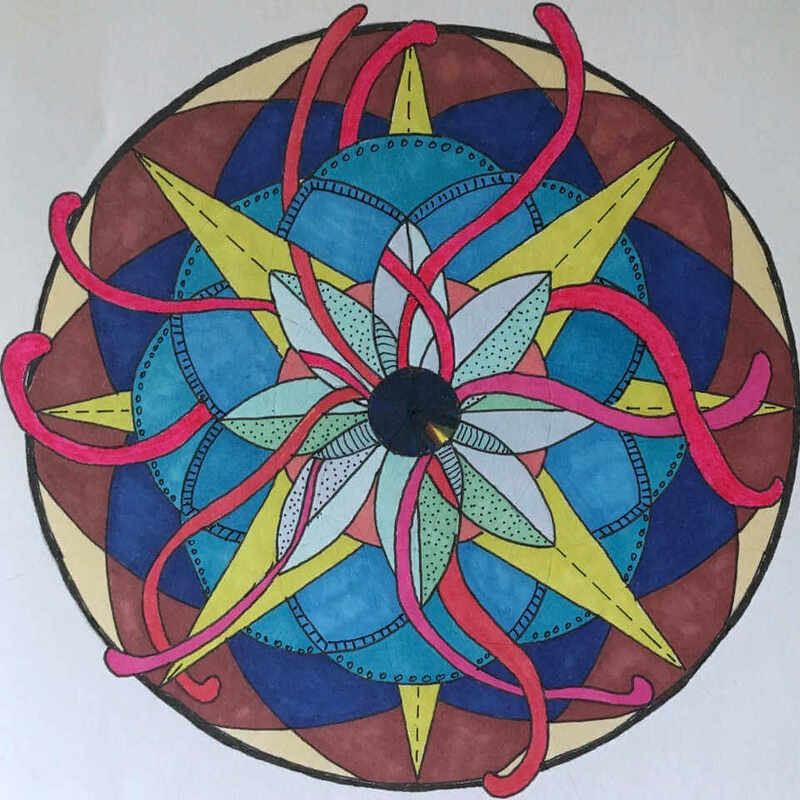 But the bright colours reflect the great joy I felt in the act of creating this mandala, and it reminds me of that every time I look at it. There is no need to be perfect, just be present and enjoy. “The present was an egg, laid by the past that had the future inside.” Lora Neale Hurston 1903-1960. 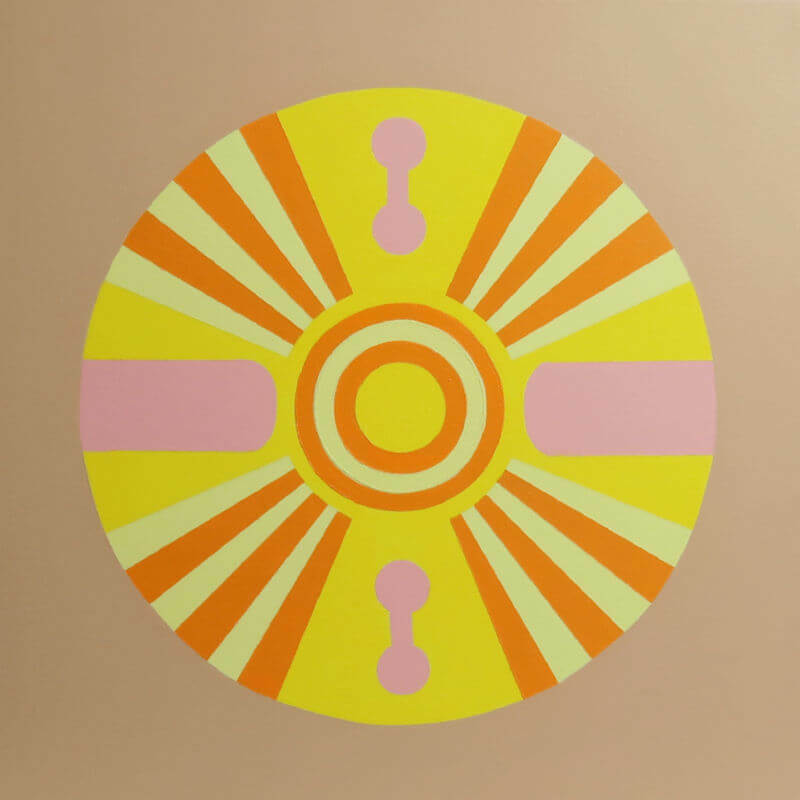 Created and inspired by a walk in the forest with a friend over the Easter weekend – this piece was a direct response to starting a new job, and a ‘resurrection’ of sorts, as I took on a more visible role in my professional field. Surface: 300lb, 100% cotton watercolor paper attached to a Gallery Cradle board. Waxed and varnished. 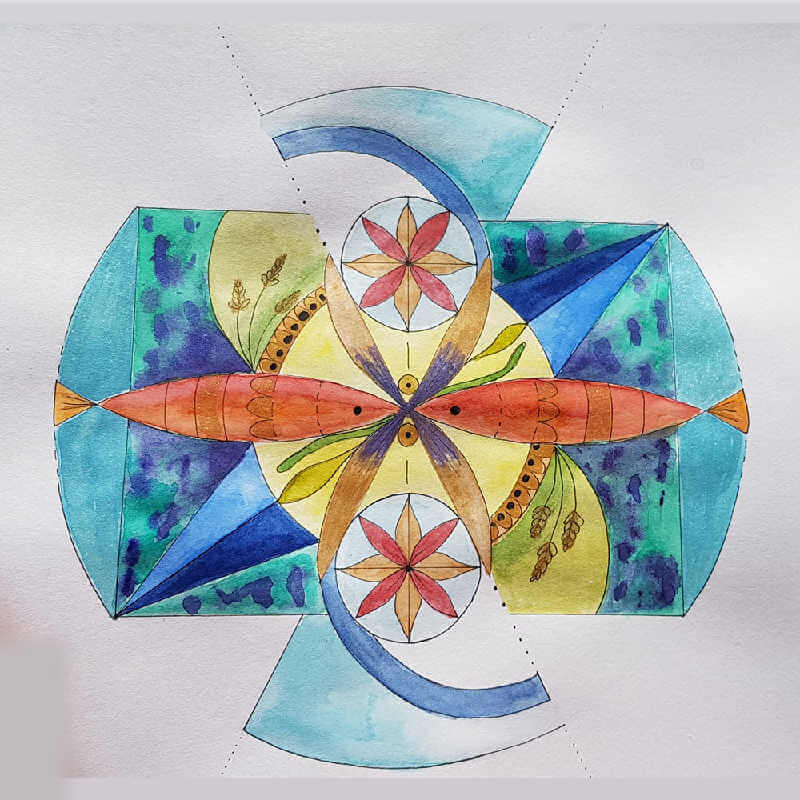 I love sacred geometry and these fishy shapes emerged spontaneously as the mandala took shape. As a symbol of creation I was inspired to paint them as literal fish. 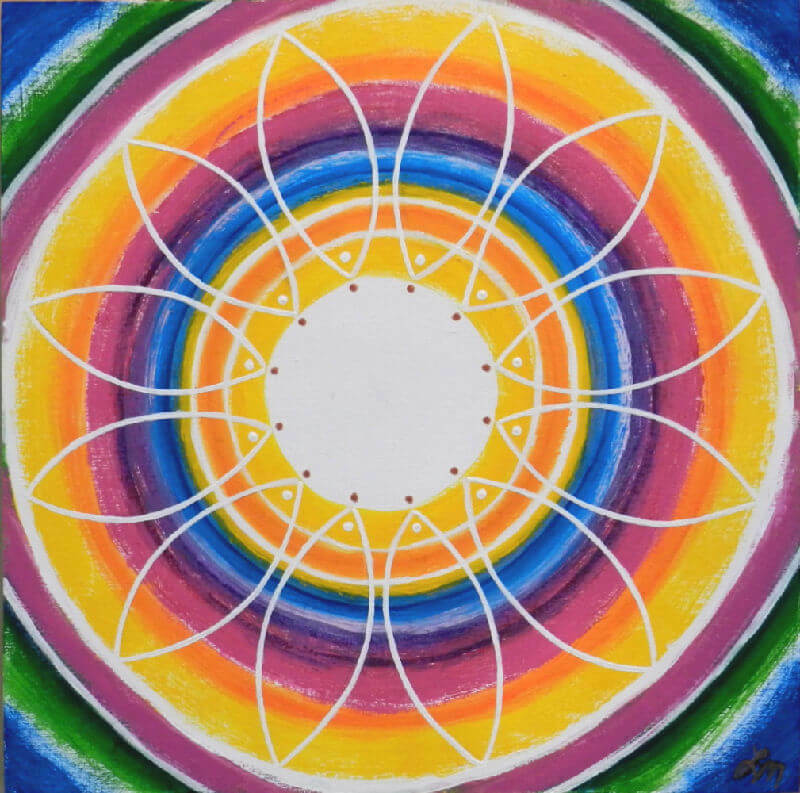 The themes of above and below which recurred in many of my mandalas at this time are shown with the ocean life which we perceive as being beneath the ground, and radiating lines connecting the spirit above with our earthly form below. 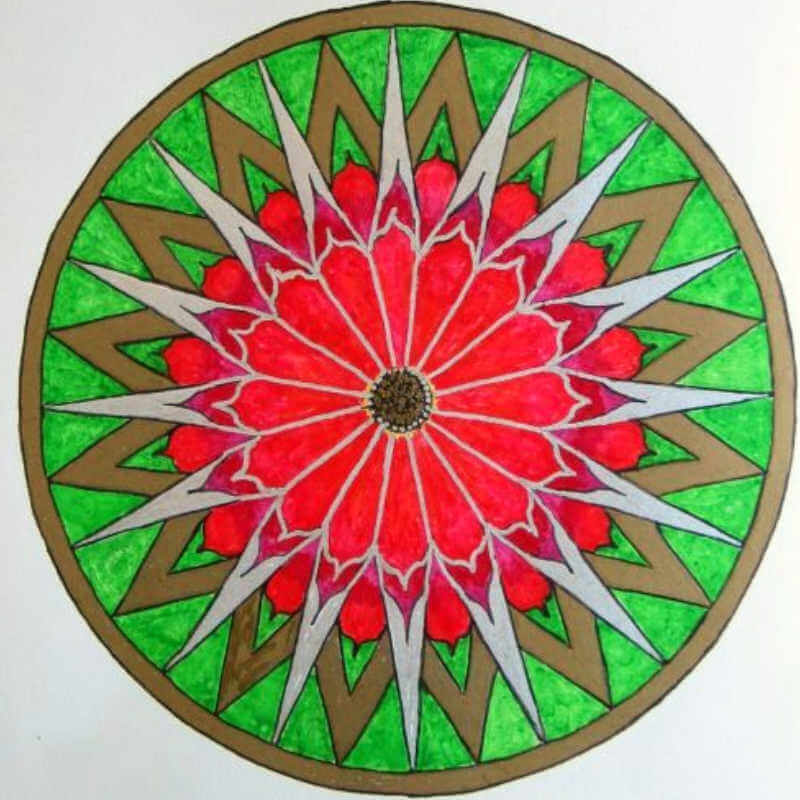 This mandala represents our mighty power of healing. 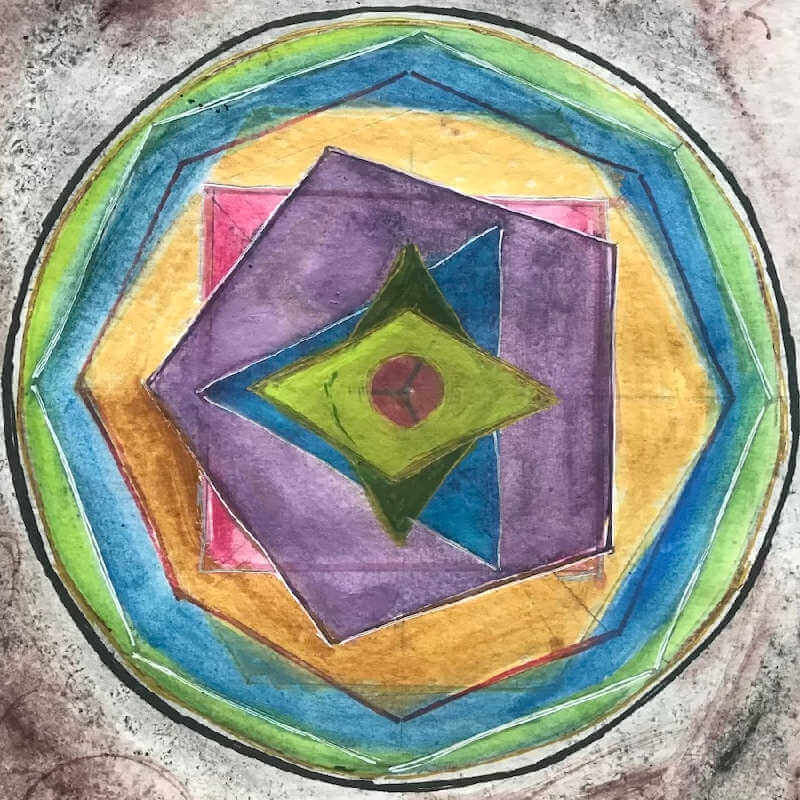 Our inner abilities hold so much wisdom and healing power… the light green triangle in the middle represents the all-seeing eye and all sensing power… We hold sacred geometry in our souls… the sacred blueprints of life itself. Once we bring about inner healing, we can project it into our worlds. This mandala has a tribal aspect, especially in its background with certain engravings visible. 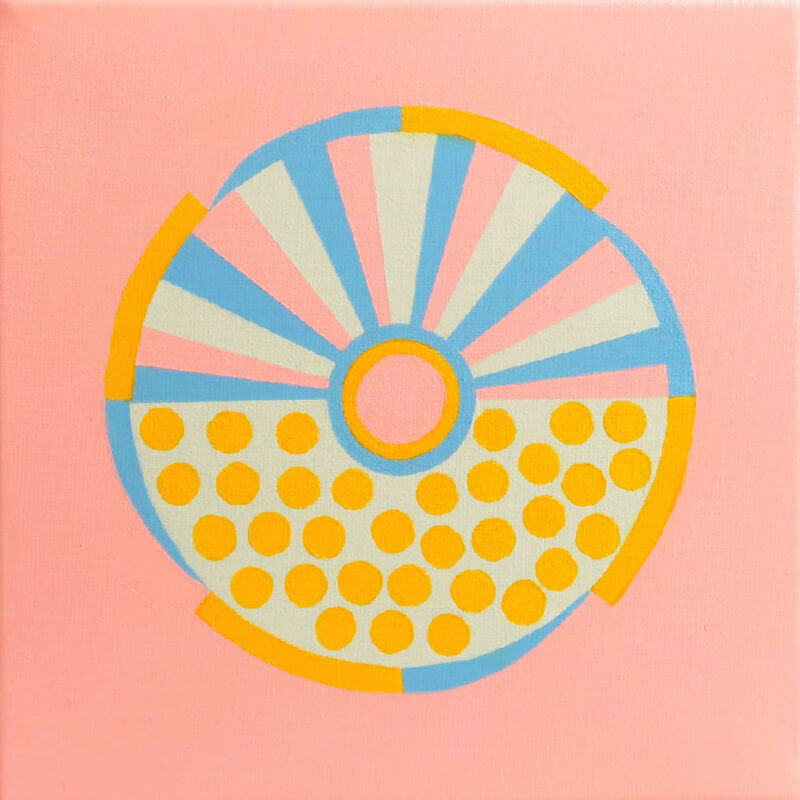 This mandala holds a sense of mystery and potential. 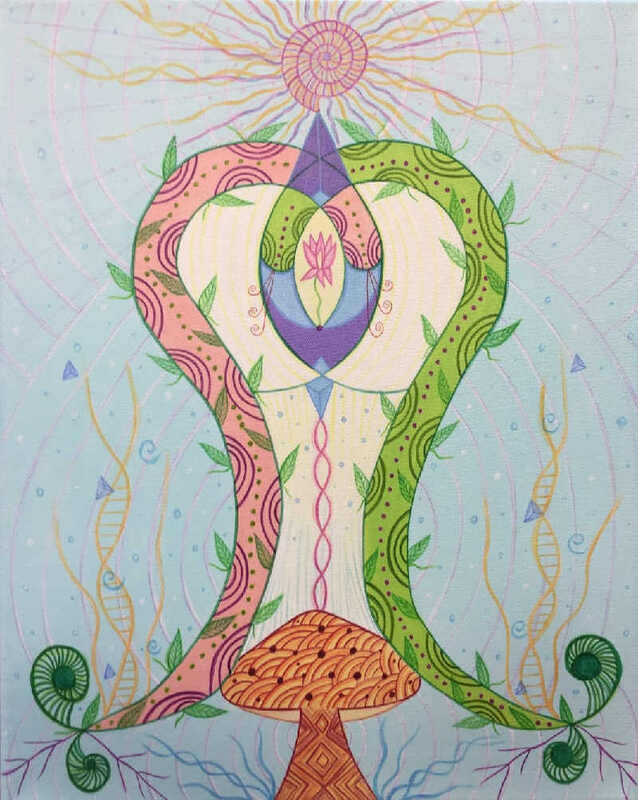 Inspired by the sacred marriage between masculine and feminine consciousness. 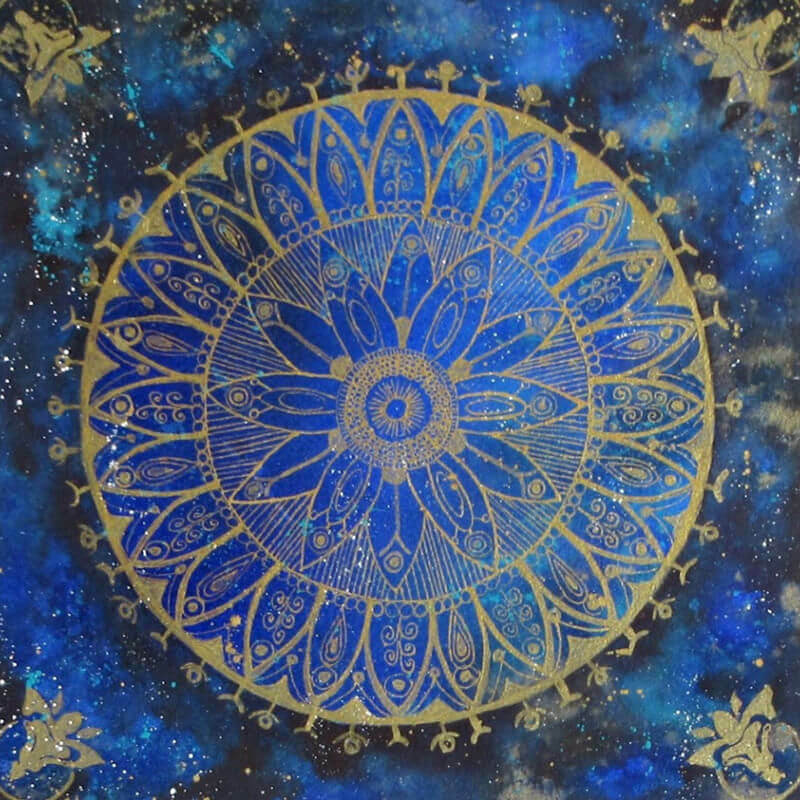 Dreaming myself awake with this mandala. During its creation, I was investigating my matrilineal family tree and had just received the results of a DNA test. It led to much mourning – the personal, the familial, the cultural. Relating the genetics of human to the genetics of land. Finding answers both in the landscape and the literature. There is a radiant joy of movement and dance throughout all of nature, for to flow and move is to live. All creatures and elements in the Universe have an inherent urge to move. Mandala, please help me understand what guards me from the ease and joy of dance. What do I need to release in order to dance and flow?